Bittersweet Enchantment: Blog Tour: Whispers of the Dead by Karen Ann Hopkins | Review & Giveaway! 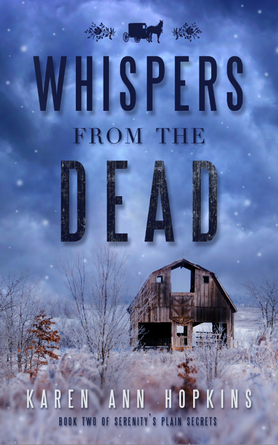 Blog Tour: Whispers of the Dead by Karen Ann Hopkins | Review & Giveaway! Welcome everyone! 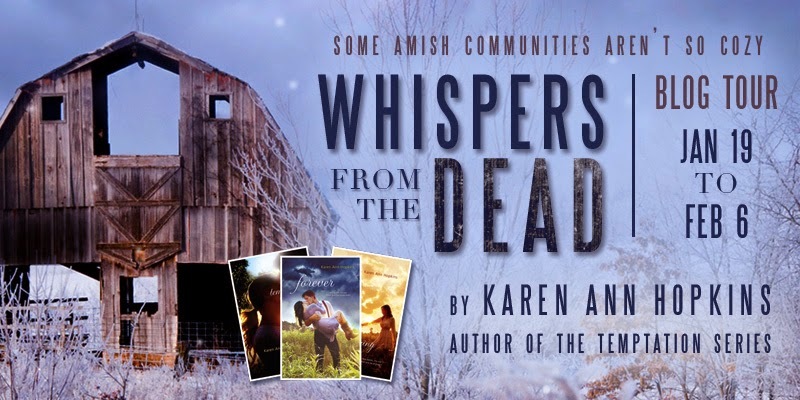 Today I have the honor of being part of the Kismet Blog Tour (review + giveaway) for Karen Ann Hopkins NEW novel, Whispers from the Dead (book #2 in the Serenity's Plain Secrets series). If you've been a follower of my blog for a while then you know how HOOKED am I with Karen's book. I've loved everything she's ever written and once you read my review below you will positively see this one is no different. Be sure to enter the giveaway below to win some awesome prizes! Enjoy! *Some language and romantic sexual content. In all seriousness, I have had the pleasure of reading all of the authors book and ended up just adoring them all! From YA contemporary to Adult Mystery, Karen can do no wrong when it comes to writing a book that everyone will love and enjoy reading for a long time to come. Of course, Whispers of the Dead is no exception. Karen, you've done it again and thoroughly entertained me with another outstanding novel! Whispers of the Dead is still set in an amish community but this time with a whole different cast of characters. Sheriff Serenity Adams and her partner, Daniel Bachman, take on a new challenge in another amish town called Poplar Springs. There has been a rash of barn burnings, a couple even have claimed the life of the town folk. It's up to Serenity and Daniel to find out who's been setting these fires, and why. They decide to stay with a man named Rowen and his children to have better access to the town. Unlike the town of Blood Rock, the people of Poplar Springs are welcoming, and kind (for the most part). They want answers too. While exploring the town, collecting clues, and speaking with the townspeople, Serenity decovers another barn somehow goes up in flames, and soon after another. Dealing with these new tragedies, she learns about a man named Asher, who happens to be Rowan's brother. Asher is bad news! He deals with drugs, selling, and maybe even murder. But could he be the one behind all of the barn fires, or is something else much more sinister taking place in the small town of Poplar Springs. Can Serenity and Daniel find out the truth before it's too late? You'll have to read it for yourself! Trust me, you will be glad you did. Right from the beginning I was guessing who the culprit might end up being and the ending was not at all what I expected. A true mystery/thriller will have your guessing right up to the very end and then shock you with the answer. Whisper of the Dead did just that! I was on the edge of my seat waiting with baited breath to find out who the firestarter was and why. I also really enjoyed the characters in the book and how each of them were written into the story. In fact, I actually liked the characters in Whipsher of the Dead more so than in Lamb to the Slaughter. I felt more of a kinship or connection with them. Where in Lamb to The Slaughter I was sometimes annoyed with the amish people because of their lack of helpfulness and honestly. Another major aspect I loved about the book was the relationship between Serenity and Daniel. Their chemistry was perfect together and they work beautifully as a team. Now while there wasn't a lot of love-dovey emotions going on, I feel Serenity really became closer to him and finally begin to trust her heart, as well as how her body reacts to Daniel. It's wasn't until the ending, they truly make their feeling known, but it was worth the wait. I'm hoping to see a lot more lovin' going on in the books to come. All in all, Whiphers of the Dead was a perfect second book in the series. A fresh new story, a new amish town and of course a new mystery to be solved makes this book another one of my favorites and a must read for those who love a good thriller. If you haven't read anything by Karen Ann Hopkins, then you're sorely missing out. I highly recommend Whispers of the Dead to you, my readers, this book and series is nothing short of spectacular! 4.5 STARS -Totally Awesome! I loved it, would read again. Want to know more about book #1, Lamb to the Slaughter? Please enter via the Rafflecopter form. Giveaway is open INTERNATIONALLY! This is the first I've heard of these books, but they both look really good. I have not read either one, but I have put both of them on my TBR list. They look like great reads and I know I will enjoy them. I have not read them yet but hope too. You can gush all you want. I can see why you enjoy this author. Her books sound amazing and I'd be thrilled to read them!